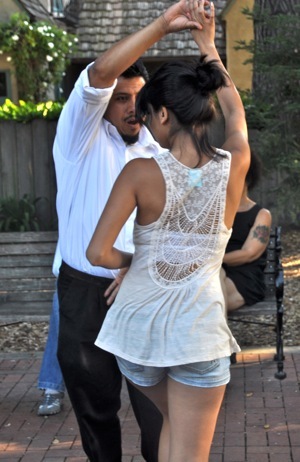 It was less a pick up line than the enthusiasm shown by the dozen or so serious salsa dancers who showed up at Fremont Park tonight to hear Brian Andres (on drums) and the Afro-Cuban Jazz Cartel. Showing off their dance moves was not easy for them. As is the case at most Fremont Park summer concerts, most of the dancers who immediately seized the dance floor were the six and under set, largely girls joined by a few free-spirited boys. That made it difficult for the serious adult dancers to display their talents. Most of them hugged the western most sidewalk. Partners where exchanged. Spirits were high. And the dancing was constant from first to the last song.